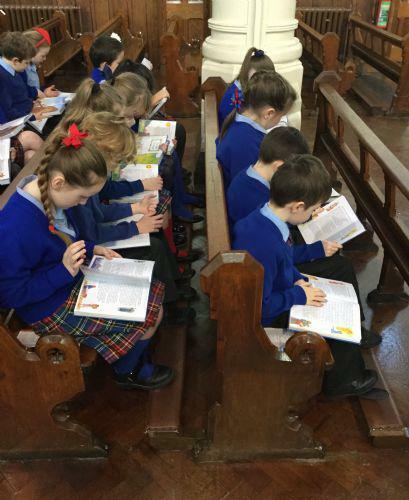 This week, the children from Year 4 made their first independent step in their Catholic faith, the Sacrament of Reconciliation (also known as Confession or Penance). The children have been preparing for this for a number of weeks both at home and in school. They have learnt about examining their conscience, thinking about the choices they make, reminding each other that God loves us, forgives us, wants us to do the same to others and that the Sacrament of Reconciliation helps us to be faithful to our Baptism and be ready for the gifts of Confirmation and First Holy Communion. We have also learnt that the first thing the Bible teaches about reconciliation is that we must make it a priority to reconcile. This is stressed in Matthew 5:21-25 where we are told that if we have an unresolved disagreement with someone that we should resolve it as soon as possible, even before we go to church again.